I was smoking a cigar the other day with a cup of coffee. About a third of the way into the stick, it dawned on me that I wasn’t enjoying this one as much as I normally do. I drained the coffee cup and picked up a soft drink and, almost at once, the cigar began to taste better. Naturally, it made me think about drinks and smokes and writing for StogieGuys.com. I know there are smokers who think, for instance, that it’s a mistake to drink anything other than water when evaluating a cigar. Some think a review shouldn’t be attempted before smoking at least three of the cigar or that a review needs to contain data such as the time of day the cigar was smoked and what other cigars were smoked previously. I find that kind of information interesting sometimes, too, but you won’t always see it in what I write here. For starters, I don’t think of myself as a “cigar reviewer.” All I’ve got to do is read and listen to some of the real experts out there to know I’m not qualified for such an appellation. Instead, I consider myself a fellow smoker who goes out of his way to keep up with what’s happening in the cigar industry, to try many different sticks, and to let you know what I think of them – much like someone in the neighboring leather chair at your local B&M might recommend a cigar or offer words of warning as you venture into the humidor. Sometimes that involves giving you my impressions after smoking a single stick; at other times my thoughts are formed after smoking a dozen or more. Among the things I really like about our format is the flexibility it provides. I can write a full review when it seems appropriate or just give you a short Quick Smoke if that works best. And when readers write in with their thoughts, reactions, questions, etc., it makes it all even better. For me, smoking cigars and writing about them is a pleasure. I don’t want to be locked in to procedures that would dictate how I do it. The last thing I want to do is turn cigar smoking into work. You may not think of yourself as a cigar reviewer, George, but I sure do. I've enjoyed/valued your impressions (just as I do for everyone on this fine site) for quite some time now — no matter what your process is. Keep the reviews coming! It's funny that you mention a soft drink. When I was in college I discovered that there was something in Coca-Cola that really went well with a cigar. I thought I had some sort of weird palette aberration, and chalked it up to personal preference. Then I saw an article in Cigar Aficionado about Alex Wong, a legendary cigar collector in Hong Kong, and he mentioned that he only drinks Coca-Cola when he smokes. So I guess I at least have one compatriot out there. By the way, you should try it. If you're calorie conscious, use Coke Zero. If you absolutely have to have an adult beverage with your stogie, try adding some dark rum to your Coke. George, if I can lay some effusive praise on you for a quick second, let me just say that one of the biggest reasons I love your reviews is that you are very careful about qualifying your statements. Things like "I've only smoked one of these, so…," or "This cigar may have been dry, but…," or "I tend not to like this brand, so…" are precisely the sort of honest, helpful statements that I wish more "cigar reviewers" would use in their reviews. All too often, professional cigar reviewers write from on high — as if their evaluation processes were flawless, and thus questioning their judgment would be foolish. By contrast, I get a real kick out of your honest, upfront, well-contextualized reviews. 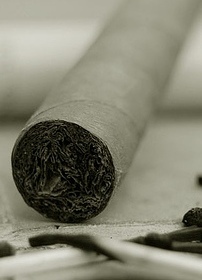 You're not afraid to call a cigar "boring" when you don't like it. You're not afraid to draw upon past experience with a brand in order to make (usually justified) assumptions about what you're presently smoking. Your reviews connect a lot of the dots that most reviews don't. They show readers how a given cigar will smoke in the real world, and not just under the strict, scientifically monitored conditions of some hermetically sealed Cigar Afficionado laboratory. When I read a George Edmondson review, I know that I'm not just getting an opinion; I'm getting an education. I really mean that. Kudos on your remarks, Jon. I would like to mirror your sentiments with the addition of some envy. I wish I could write a review so well! Thanks for all the kind words! I really do appreciate them. And I say we all celebrate with a cigar!